It’s okay for men to groom their eyebrows. Eyebrow hair fall and grow like normal hair. Keep your eyebrows in their perfect shape. 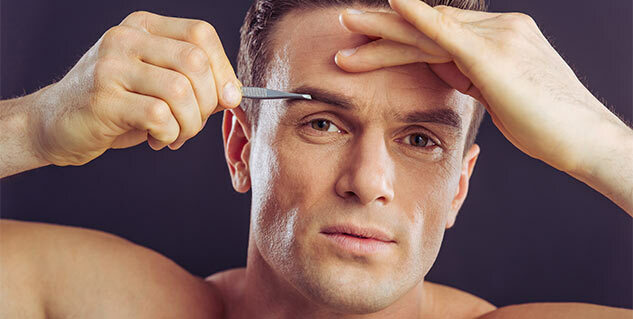 Eyebrow grooming is as important as grooming your hair, but most men have no clue when it comes to eyebrow grooming tips. Nicely groomed brows can take your look from fine to great. Here are some of simple yet awesome eyebrow grooming tips for men. Since plucking is the first things men do when they start struggling with their eyebrows, it has to be the first of all tips to groom eyebrows. To pluck your eyebrows you just take a pair of tweezers and pluck out any brow hair that don’t fit with the desired shape of your eyebrows. Though a little painful and time-consuming, plucking is as simple as grooming can get. To do it the right way, start by washing your face to make your eyebrows little damp. Now stroke your eyebrows making the hair stand up. You will now easily be able to isolate the odd ones out. Pluck hair that are significantly larger than the rest. You can also pluck hair from the edges to enhance the shape you like. Another simple and smart way to get the perfect eyebrows is to get an eyebrow trimmer. You can get a simple trimmer from a local store, but make sure that you buy one from a reliable brand only. The kit is likely to have a tiny comb or something like a comb to pull the brow hair straight and the trimmer cuts all the hair to the same length. Trimmers work great with maintaining the length of the eyebrow hair but don’t offer much help when it comes to maintaining the outline. Threading is an extremely simple method for removing unwanted hair from the eyebrows, especially from the outline. In fact, nothing works better than threading when it comes to maintaining the outline to match your desired look. A small thread is twisted to catch and pull out unwanted hair. The only downside with threading is that you need a professional to take care of the job, you shouldn’t even try it on your own. A profession from your local salon can easily do the magic with a twisted thread to enhance the look of your eyebrows without any discomfort. Although waxing is not what all people would need to try for their eye brows, but if you have to much of hair around your eyebrows that start looking odd within days of threading or plucking you can wax them for better look. Ask a professional to wax of the extra unwanted hair from around the outline of your brows. It’s a good call if you avoid shaving your hair, as shaving would eventually turn your eyebrow hair looking more like your shaved moustache after couple of days. But if the eyebrows shape you want needs a little nick of the blade, leave it to the professional and keep it to the minimum. Also it’s worth remembering that it’s best to enhance your look rather than trying to achieve a look which may not even suit your face. So understand the original shape of your eyebrows and then plan something which goes along nicely with that shape. Read More articles in Beauty & Personal care.